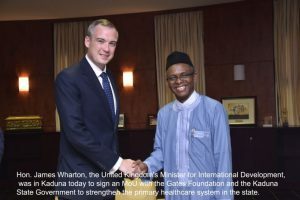 Nigeria’s Kaduna State Government, the United Kingdom’s (UK) Department for International Development (DFID), and the Bill & Melinda Gates Foundation (BMGF) have today announced a new strategic partnership on health and governance, taking an important step towards stronger primary health care services in rural communities. The Memorandum of Understanding (MOU) will advance the implementation and transformation of the primary health care system in Kaduna State, and builds upon ongoing support by BMGF and DFID for polio eradication, routine immunization, family planning, and maternal and child health services. A recent state wide assessment in Kaduna has led to a new reform agenda by the state government to improve primary health care delivery. The new Partnership will support this agenda by working to address the root causes of poor performance in primary health care. This includes strengthening governance, accountability, the distribution of health care workers, financing and management processes, data systems, accessibility to essential medicines, as well as primary health care delivery. Despite significant health investments, Nigeria continues to face high infant, child and maternal mortality rates. Statistics from a 2013 Demographic and Health Survey highlight that only 32% of women in Nigeria give birth in a primary health care facility, only 44% of children in the country are fully immunized, and almost 60% are underweight. The United Kingdom is committed to helping Nigeria to address the causes of and eliminate poverty, ensuring no Nigerian is left behind. As part of wider multi-sector support at Federal and State level, the UK Department for International Development has invested extensively in health care in Nigeria and Kaduna State, with a particular focus on primary health care, reproductive, maternal, newborn and child health, immunization, HIV/AIDS, malaria and nutrition. This Memorandum of Understanding further strengthens the UK’s partnership with the Kaduna State Government and with the Bill and Melinda Gates Foundation under a shared vision to improve health. “Our programs are structured to ensure that a pregnant woman does not die due to her inability to access quality services during pregnancy and childbirth, that a child is not lost from preventable diseases, that communities are not overburdened with endemic diseases, and that community linkages are harnessed and promoted”.